When we caught wind of Adidas and Parley's latest campaign 'Run For The Oceans', our initial response was 'yes!'. If you haven't heard, they've embarked on manufacturing their shoes with recycled plastic from oceans. In purchasing their shoes, you can rest assured that you have contributed to eliminating beach and ocean contamination. It’s a great concept at first glance, but there's more to this story and money to be made. At the end of the Adidas x Parley's advert, they ask what if everyone contributed to creating a better environment? This is where APT comes in with the BeachCleana, a modular trailer mounted beach clean-up and waste recovery system designed to separate the natural material (sand and mud, for example)from the foreign non-biodegradable objects (such as plastic) which can then be recycled. Our design was based upon thorough engineering and development; we wanted to minimalize the work and financial input required on your part as much as possible whilst maximizing output. It was not designed with mineral recovery alone in mind. This nifty piece of equipment is particularly suited to capturing errant plastic waste such as plastic bottles, plastic pieces as well as other dangerous objects such as glass which can cause serious bodily harm as well as objects such as netting which can cause trouble for animals and pets. The equipment is available in a variety of sizes, from small start-ups to larger developments. Any company wanting to recover waste plastic for either CSR or for onward manufacture of recycled products should consider this. Looking back at the Adidas x Parley campaign, what comes after is the opportunity to be a part of the innovators and game changers. In separating the natural and waste materials, you then have the possibility of taking this material and making anything of it. Selling it on to companies like Adidas, using it to produce your own goods, the opportunities are endless. Plastic is not going anywhere and the need to re-cycle is only increasing; think smart, think APT. 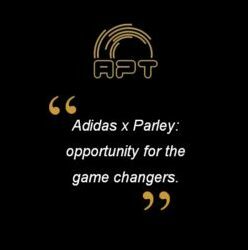 Contact us here for further information and click here to see the Adidas x Parley campaign. Older PostWatermaster: the full mining solution!